Sandstone petroglyphs at Leo Petroglyph State Memorial park, attributed to the Fort Ancient Indians, 900 AD-1500 AD. The Leo Petroglyph is an Ohio History Connection site located northwest of Leo, Jackson County, Ohio. The photograph was taken ca. 1940-1949. Leo Petroglyph is located in Jackson County near Leo, Ohio. It is actually a series of petroglyphs, or rock carvings, ancient Indians chiseled into an outcropping of sandstone in southeastern Ohio. The precise age of these carvings is unknown. Based on the symbolism and the amount of weathering of the generally soft sandstone, they probably are less than one thousand years old and so likely are the work of the Late Prehistoric period Fort Ancient culture, or of American Indians living in the region during the period European contact. 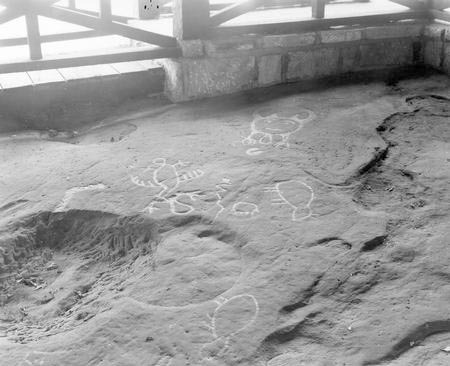 There are between thirty and forty different designs carved on the rock, including human figures, birds, a snake, a fish, human footprints, and bear paw prints. The most arresting image on the petroglyph panel is a human head with horns or antlers and small bird's feet. The image may represent a shaman, or medicine man, transformed into a supernatural being. David Zeisberger, the Moravian missionary, described symbols painted on trees by Ohio's Lenape (Delaware) people as "hieroglyphics" that are "understood by the Indians who know how to read their meaning." Unfortunately, we do know the full meaning of the inscriptions at Leo Petroglyph. Leo Petroglyph is listed on the National Register of Historic Places. Lepper, Bradley T. Ohio Archaeology: An Illustrated Chronicle of Ohio's Ancient American Indian Cultures. Wilmington, Ohio, Orange Frazer Press, 2005. Swauger, James L., Petroglyphs of Ohio. Ohio University Press, 1984.